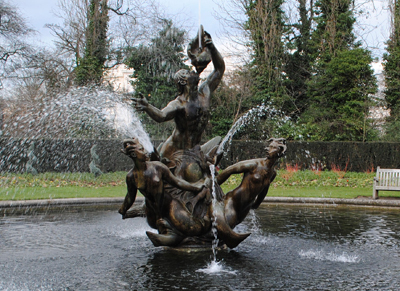 Located in Queen Mary’s Gardens in The Regent’s Park, this round fountain features a bronze centrepiece depicting a sea triton blowing on a conch shell with two mermaids (also sometimes referred to as dryads or nereids) springing out of the water at his feet. Designed by William McMillan (he also designed one of the fountains in Trafalgar Square), the sculpture was offered to the gardens by the painter and sculptor Sigismund Goetze when the gardens were redesigned. Goetze lived in Grove House (now Nuffield House) on the northern perimeter of the gardens for 30 years until his death in 1939 and had a studio within the grounds; this sculpture was one of a number of features he donated to Queen Mary’s Gardens. The sculpture, however, was not finished due to the interruption of World War II and it was only in 1950, long after Goetze’s death that it was erected and dedicated by his wife Constance to Sigismund’s memory – “painter, lover of the arts and benefactor of this park”. The site on which the fountain – which received a gold medal for being the best sculpture exhibited in London that year – was located was formerly occupied by a conservatory which belonged to the Royal Botanical Society. Incidentally, in 1944 Constance Goetze founded the Constance Fund which funded fountains in Green Park and Hyde Park. WHERE: Queen Mary’s Gardens, The Regent’s Park (nearest Tube stations are Regent’s Park, Great Portland Street and Baker Street); WHEN: 5am to 7pm daily (closing times vary depending on the month); COST: Free; WEBSITE: www.royalparks.org.uk/parks/the-regents-park.